Turkish prosecutors have probed Cumhuriyet newspaper after it published excerpts from the latest Charlie Hebdo issue which features cartoons of the Prophet Muhammad. It comes after a ban was ordered on websites uploading the cartoons. The secular Turkish newspaper Cumhuriyet published black-and-white excerpts from Charlie Hebdo’s latest issue in two of its columns on Wednesday. The reprint was aimed as a gesture of solidarity with the French satirical magazine, whose office was attacked by gunmen last week, Cumhuriyet editor-in-chief Ufuk Cakirozer said on Twitter. Police came to inspect cars containing the publication to make sure the issue did not contain any reprints of Charlie Hebdo’s cover cartoon, which features the Prophet Muhammad in tears, the daily said. The newspaper was not running the cover, Cumhuriyet’s editor-in-chief said. Although the cover cartoon was omitted and authorities eventually gave the green light for distribution, an investigation was still launched. It found that two columnists had inserted a thumbnail of Charlie Hebdo's cover into their writing. The two will now be summoned by the Istanbul Prosecutor's Office, Hurriyet news reported. They may be charged with inciting hatred or hostility. This comes after the country's Prime Minister Ahmet Davutoglu slammed the newspaper, saying that Turkey "will not allow insults to our Prophet.” Islam prohibits the prophet from being pictured. In Turkey, where over 95 percent of the population is Muslim, insulting the faith is a crime punishable with jail. On Wednesday, a court of the southeastern Turkish city of Diyarbakir ordered the country’s telecommunications authority to ban access to four websites which published the cartoon of the prophet. "Freedom of the press does not mean freedom to insult," Davutoglu said at a media conference in Ankara on Thursday. He stressed that Turkey condemns the Paris attacks, but also wants to protect the honor of the prophet. 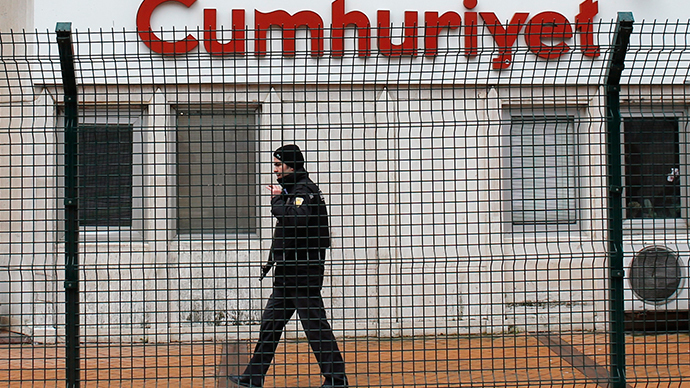 Following the publication of the Charlie Hebdo cartoons by Cumhuriet, protesters gathered outside the Turkish daily’s HQ, local media reported. They held a demonstration against the paper reprinting the cartoons. The newspaper’s staff also reportedly received death threats following the publication.